The Hamatan has hit this week. That means it is cold in Benin and the coats and stocking caps are sprouting like weeds in the springtime. Last night I suspect it dropped as low as perhaps 75 and today it probably didn’t break 90 for the first time in a while. The biggest difference, in addition to the winter wear of the locals, is probably the dust in the air, which makes the sunrise quite spectacular and the sunset also. The dust in the air also translates to dust in the house and everywhere else, however. It probably starts out clean from the Sahara Desert but by the time it falls here it has picked up the moto and diesel truck smoke and becomes a real fine black dust that gets on and in everything. It is impossible to keep anything clean. We forgot to report on Elder Schwieger’s birthday last week. 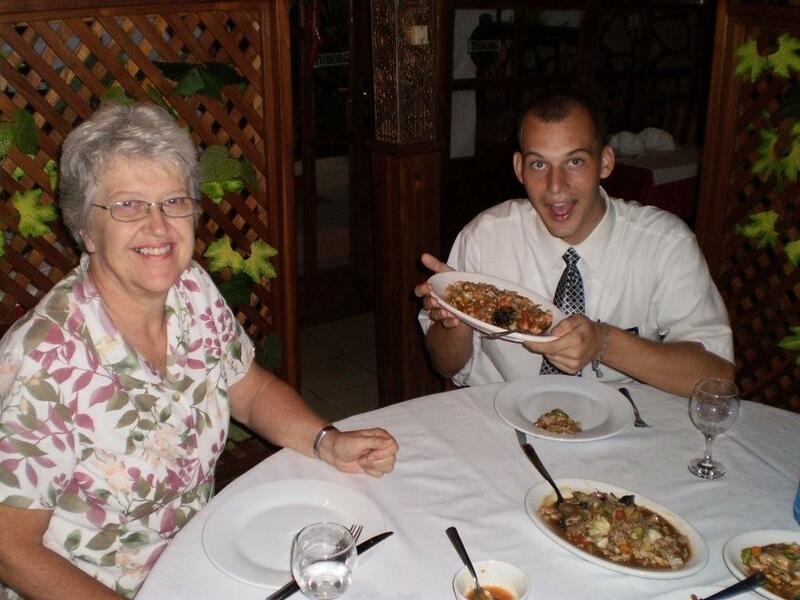 Between traveling to Togo and planning for two zone conferences, Soeur Black didn’t have time to fix a proper birthday dinner so we took Elder Schwieger and his companion Elder Samatamu out to a fairly decent Chinese restaurant for dinner. As it turned out it was also a going away dinner for Elder Schwieger although we did not know it at the time. For some time now he has been having digestive problems. At first we thought it was probably just the African food adjustment but since it did not go away, we took him for some tests that were sent to the doctor in Accra. As things developed, Doctor Stubbs became convinced that it could possibly be something serious that cannot be treated here so we put him on the airplane on Wednesday to return to Sacramento California and hopefully some competent medical help that can diagnose and correct the problem quickly. We sure hated to lose Elder Schwieger. He has definitely make his mark here in Cotonou in the 8 months he has been here. He came out speaking quite a lot of French and really hit the ground running. I think a little part of all of us left with him when he went. We were glad he got to stay for the zone conference before he left. We mentioned last week that we went to Togo and picked up President Ayekoue at the airport on Friday. On Sunday morning, Elder and Sister Cardon arrived also. 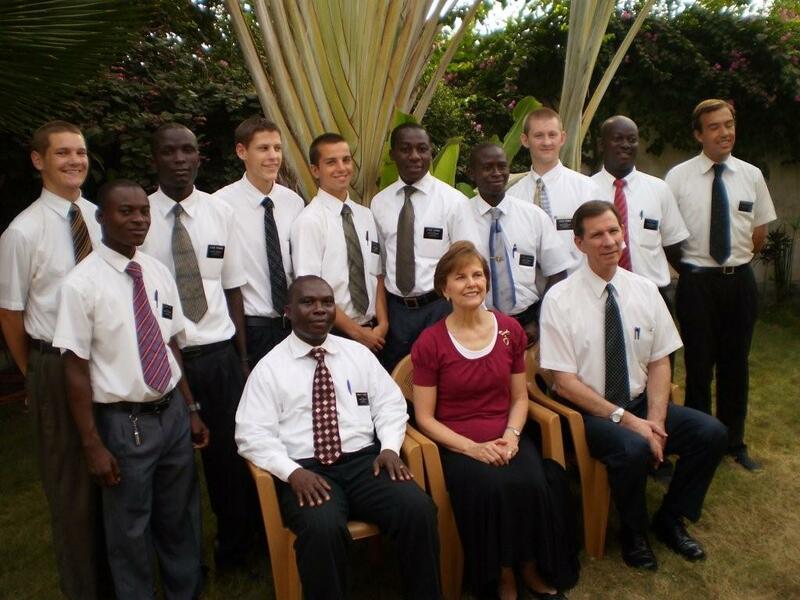 Elder Cardon is a member of the 2nd Quorum of Seventy and first counselor in the Africa West area. On Sunday we attended church in one of the branches in Lome and then had a nice dinner which Soeur Black had prepared at our house. The Cardon’s and President Ayekoue stayed in a hotel the remainder of the time. On Monday we had them and the 10 elders working in Lome to our house for zone conference and a dinner after which we all went to the chapel and held a meeting with the Lome branch members and investigators. Tuesday morning we picked them up at the hotel and headed for Cotonou, arriving in time to have a meeting with the Branch members and investigators here. Since the meetings were in the afternoon we didn’t have a huge crowd in either city but nevertheless the chapel was full by the time we finished. On Wednesday we had another zone conference here in Cotonou during which Soeur Black again fixed an excellent dinner for the missionaries and guests. 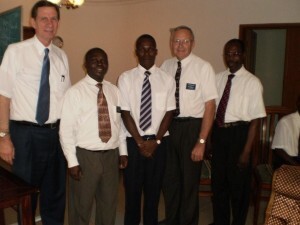 As soon as that was over, we had to take Elder Schwieger to the airport and then a little later the Cardons and President Ayekoue. Following that, Soeur Black and I returned home and pretty well collapsed. Not totally however, because we had to get Frere Godwin, now known as Elder Douti on his way on Friday. Elder Douti came to the zone conference and then was set apart by President Ayekoue right afterwards. We were glad we had him as a missionary because he was able to replace Elder Schwieger on Wednesday night and Thursday. 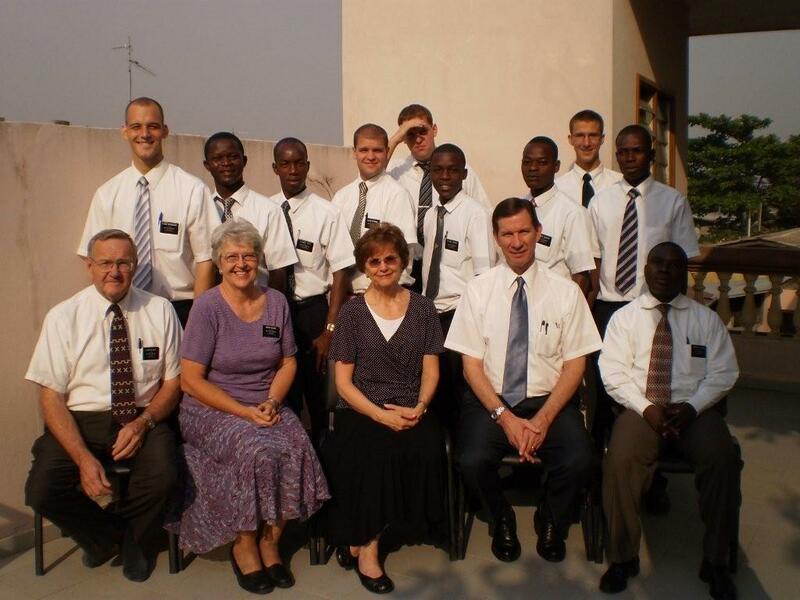 Thursday night we had to do some more missionary shuffling and Elder Douti stayed here with us in order to be able to leave early on Friday. If all went well, he should be in the MTC in Ghana now learning how to be a missionary. It was good to see him excited and ready to go. He will be a good missionary. It was also a little hard to say goodbye, knowing that it is entirely possible that we will not see him again in this life. Nevertheless, as we believe families can be together forever, and knowing that we as members of the church are a family, we are sure that we will see him as well as all the other we have come to love at some point in eternity. I think that may be one of the best things about eternity – not having to say goodbye. I suppose there are a few people in life you don’t mind saying goodbye to, but there are a lot more that you wish you could see from time to time. We have noticed that our mission here is much more rewarding when we can visit families, get acquainted with the people, find out their problems and concerns, play with the children and teach the gospel than when we simply have to do administrative chores. We got to make one such visit on Friday evening. We have talked about the Briga family before. 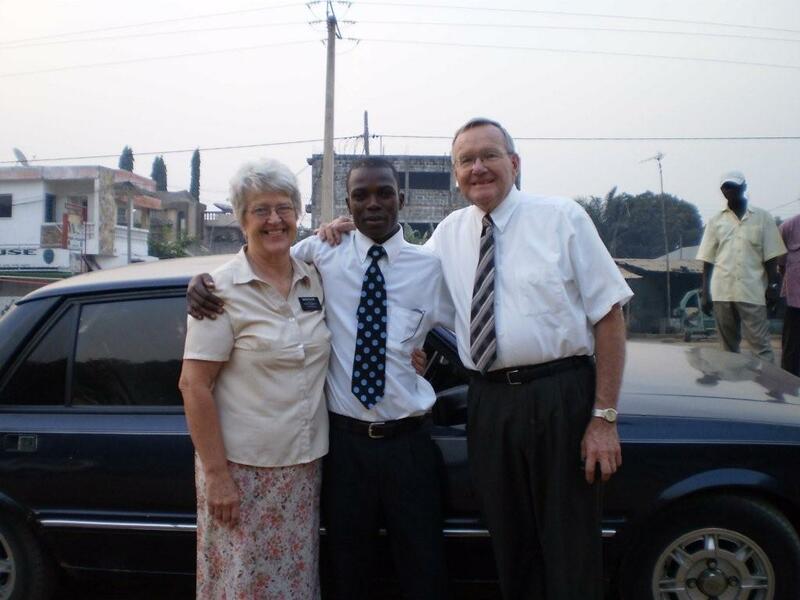 Charles Briga was the Elder’s quorum president and now is 1st counselor in the Menontin Branch. His wife is not a member but comes most of the time. Both are in the Benin military as a career. I call Brother Charles my Angouleme brother as he joined the Church in France and spent some time in Angouleme where I spent the first half of my mission years ago. Originally he was there for pilot training, but he was washed out so now he is a technician working on radios and such on military aircraft. We are not sure exactly what Soeur Helene does but we know she packs a machine gun and does guard duty at times. They have two of the cutest little girls you have ever seen. We had an appointment to teach Helene the 2nd discussion on Friday night. Shauna (and the 8th Ward Primary) made some dolls and sent to us at Christmas time so we decided to give the little girls one of the dolls. Maelle, the older girl took the doll first and gave it appropriate love, then Myla, the little 2 year old took it and held on with a death grip. It was really cute. I don’t know if they have ever had a doll before but they knew exactly what to do with it. 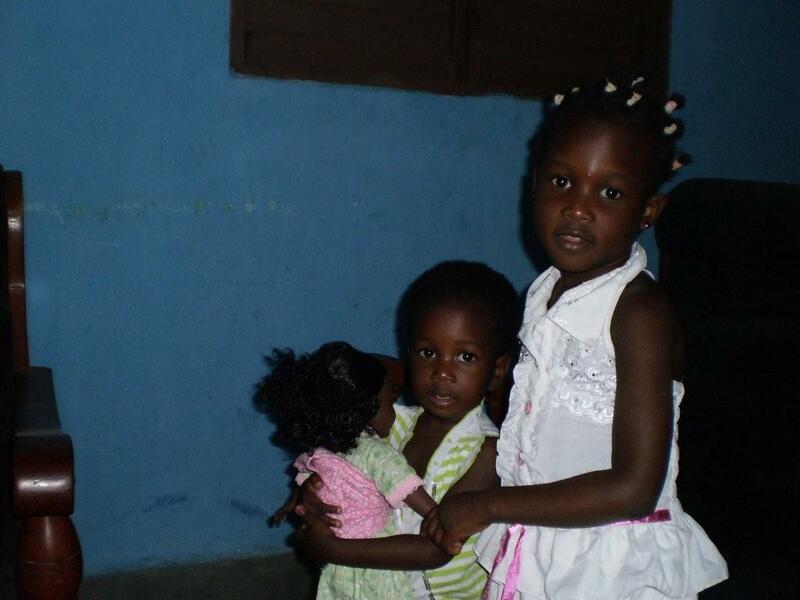 We also helped Frere Paul and his wife, Honorine, and two little boys move into their new home on Friday. Frere Paul was the financial clerk in the Cotonou Branch and is now the 2nd Counselor in Menontin Branch. The home is a few miles out of town but Paul says it won’t affect their church activity. He has a moto to ride back and forth and puts his whole family on the moto. I guess we can’t really blame him. A few years ago we moved out of town when our family was small also. We have not regretted the decision. Our house may have been a little nicer but the concept is the same. The Dansou’s have two rooms, concrete floors, a tin roof overhead and a well outside from which they can pull water. No electricity, cabinets, countertops, or other conveniences but they are happy and thrilled to be in their own home. It is larger than the place they moved from and there is no place like home. We have learned the full meaning of that from being in Africa.